Why Should Businesses Start Using Chatbots? When a customer gets in touch with a business, (s)he wants prompt responses. Delays in responding to queries can lead to loss of business, and a growing feeling of frustration among users. A company might have the most dedicated customer service representatives and marketers on board – but these people will have their specific working hours, leaves, and general off-times. An advanced AI-powered chatbot has no such limitation, and can remain available to respond to people’s queries at all times. Quick, immersive interactions are the essence of chatbots. At last year’s Microsoft Build conference, Satya Nadella said that ‘bots are the new apps’. While the average smartphone-user in the United States has 23-24 applications installed on his/her device, (s)he typically spends close to 80% of the time on 5 apps (among which, at least 3 are likely to be IM apps). 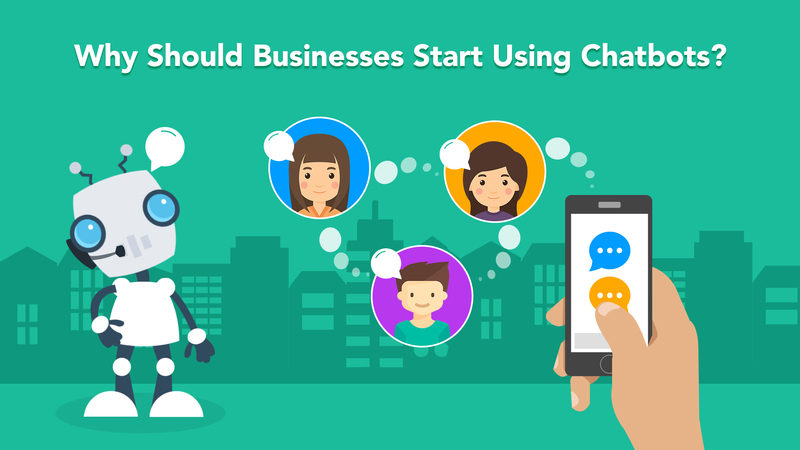 It is, hence, easier, to build a chatbot on an existing platform – say, Facebook Messenger – than hoping for the success of a new, independent business app. Practically everyday, users face irritating delays during phone calls to businesses. Human representatives might have to transfer calls to other personnel – and in the meantime, the caller is left to hearing music or voiceover ads. Emailing is not a particularly great form of initial communication either, since there can be a considerable time-lapse before replies come in. Chatbots offer a smarter alternative to all these traditional forms of communication. People love to interact with fellow-humans, and not faceless entities. Chatbots bring this much sought-after human touch to business communications. Instead of having to solely deal with mechanical call-to-action verbs (‘download’, ‘click here’, ‘call us’, etc. ), users can actually have proper two-way conversations – complete with social courtesy and politeness (‘hello’, ‘how are you’, ‘thank you’, etc.) with chatbots. As a result, engagement levels are likely to go up, interest-levels among users would grow, and the business would benefit. Chatbots powered by high-quality machine learning methods and artificial intelligence are well-equipped to study and analyze the behaviour of customers – when the latter are on a portal. This analysis is vital, since it can tell the business about the correct marketing and sales strategies – and even frame out the ideal marketing campaigns for different products/services. What’s more, with enhanced word-learning support, bots can offer a highly personalized experience to users. They can ‘remember’ previous interactions with customers, and present information accordingly. With chatbots, conversations can be more contextual than ever before. Imagine having to call a cab while you are talking on the phone. You have to put the other person on hold, exit from the phone menu, pull up the on-demand cab app and request a pickup, exit from that, and then get back to the call. The process is elaborate, time-consuming and can often become rather confusing. Chatbots, however, make such multitasking extremely simple. While talking on the phone, a person can simply tell Siri or Google Assistant to call a cab. Simultaneously conversing with a chatbot and browsing through other mobile applications is easy. Business representatives typically have to answer a common set of questions posed by first-time users. Instead of having to hire additional employees for such repetitive, menial work – it would make sense to delegate the task to AI chatbots. The answers for such general, repeated queries can be made available on the website FAQ page or the Facebook page as well, but for a customer seeking quick resolution to his/her queries, the services of a chatbot are more suitable. If a business promises to deliver instant consultations to clients, chatbots are definitely the way to go. For all the interest and hype about AI-powered chatbots, the technology is still in a nascent stage. By starting to use a smart chatbot service, a business can easily lay down a point of difference from its competitors. In other words, the presence of a chatbot can very well serve as an important competitive advantage for a company. According to industry insiders, the adoption of chatbots is increasing at a rapid clip – and within the next 8-10 months, the market will move into the ‘early maturity’ stage. Till then, there are considerable advantages to be had by becoming one of the ‘early adopters’ of chatbots. A chatbot that can only ‘speak’ with customers via text can be a bit of a bore. Such a bot might not be of much practical use either – particularly for online shopping portals and other sites, where users typically want to check out a quick visual representations of products/services. Thankfully, most sophisticated chatbots can share HD images, videos, PDF manuals and much more – providing users with a holistic experience. The need to click on links and visiting different pages can be effectively done away with. Chatbots can literally ‘show off’ the items that a business wishes to sell. Note: Chatbots can also have multilingual support – ensuring a wider audience for a particular business. Creating a chatbot for business (with full AI support) is neither a lengthy process – and nor is it a pricey affair. On average, beta versions of chatbots can be made in a matter of days – and early testing can be started with internal users, and finally end-users. In comparison, building a full-fledged cross-platform mobile business app can take 6-8 months, if not slightly more. All that the developers have to do is to integrate any of the several available bot templates (from Microsoft, Facebook, etc.) inside a reliable, existing messenger platform. The ease of development makes sure that building a chatbot is not expensive either. Chatbot makers generally offer different, reasonably-priced development models – and businesses can take their pick, based on their precise user-interaction requirements. Modern-day chatbots are typically more ‘proactive’ in nature than traditional live chat options. The latter are generally rather ‘passive’ – delivering responses only AFTER a customer has placed a query. Chatbots, on the other hand, can start off with a ‘Hi!’, or a ‘Good day!’, or ‘How can I help you today?’ – which, in most cases, spark off a real-time conversation. The proactive method of communication, together with high levels of machine learning, help chatbots in being able to retain customers more effectively. The face of business, as we know it, is changing. Internet of Things (IoT) is making a big difference – and by 2020, there will be close to 50 billion connected gadgets in the world, and 2 out of every 3 businesses will be implementing custom IoT tools and solutions in their mobile applications. Chatbots, by nature, are dynamic – and they can be easily built on smart watches, smart glasses (with AR/VR capabilities) and even in smart cars. In fact, chatbots can be used by businesses to establish (and maintain) connections with targeted users via any web-enabled device. At present, a large number of chatbots in use have limited functionality – but in the next 3-4 years, the rough edges are going to be ironed out. The website of a business, obviously, has a home page. From there, a user has to visit the ‘Products’/’Gallery’ page to view the products available for sale (the task gets all the more complicated on large shopping websites). Once a product is chosen, the buyer has to move on to the ordering page. From there, the secure payment gateway has to be visited, for completing the transactions. There are considerable risks of customers ‘dropping off’ between any of these steps – translating into a ‘lost sales lead’. Chatbots can go a long way in making this ‘buyer journey’ more convenient and seamless. People can state their preferences, view products, make their choices and even make payments on the same chat window. No need to navigate to different pages whatsoever. Note: From September last year, the FB Messenger (v.1.2) chatbots started accepting payments. From restaurants and healthcare, and from travel, shopping and other fields – chatbots hold out big benefits for practically all types of businesses. They can help with the marketing plans, generally have simplistic, user-friendly UIs (once again, think how easy it is to use Facebook Messenger), boost social media engagement levels, plan personalized ad campaigns, and even actively seek feedback about the websites they are hosted on. Internally too, chatbots can be used for task-scheduling purposes – and they help in bringing down the total manpower hiring costs too (many regular tasks can be performed by the AI bots). In addition, business chatbots often have a ‘personality’ of their own – helping their conversations seem that much more enjoyable for users. Chatbots bring the ‘here and the now’ element to all types of communications with businesses. Although they are not going to completely replace human beings anytime soon (nor are they meant to do so!) – these chatbots can indeed take up the performance and popularity of a business to the next level.